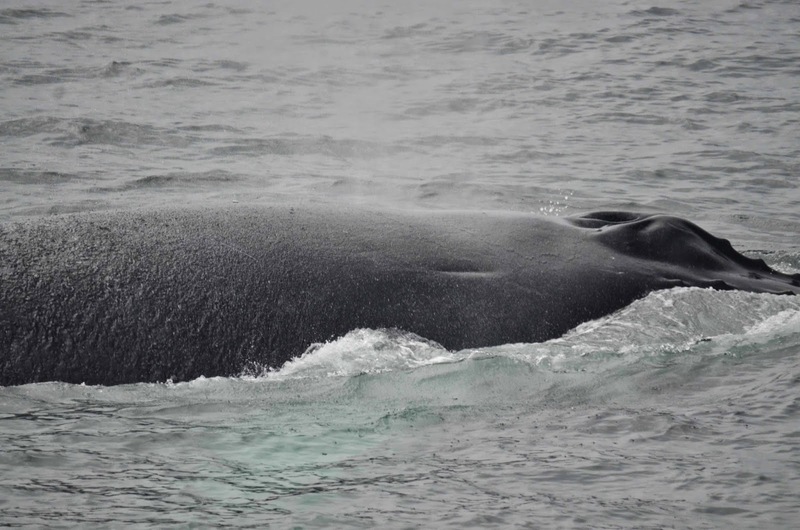 This morning we headed into the fog and rain on our 10 am 4th of July whale watch. As we pulled into the area off the southwest corner, there were three different scattered humpback whales! The first humpback we came across was Mogul but we pulled up to Orbit who was doing some subsurface feeding with using the single bubble cloud method. Nearby, Hancock was bubble net feeding and lunging right up out of the water with each surface! We had amazing views of both Orbit and Hancock who, on separate occasions, created their feeding bubbles directly next to the boat! This shot really puts into perspective just how large these humpbacks are. Unfortunately due to deteriorating weather conditions, we were unable to find any whales on our 3pm whale watch. Torrential downpours and howling wind made it slightly difficult to see more than 50 feet in front of us. 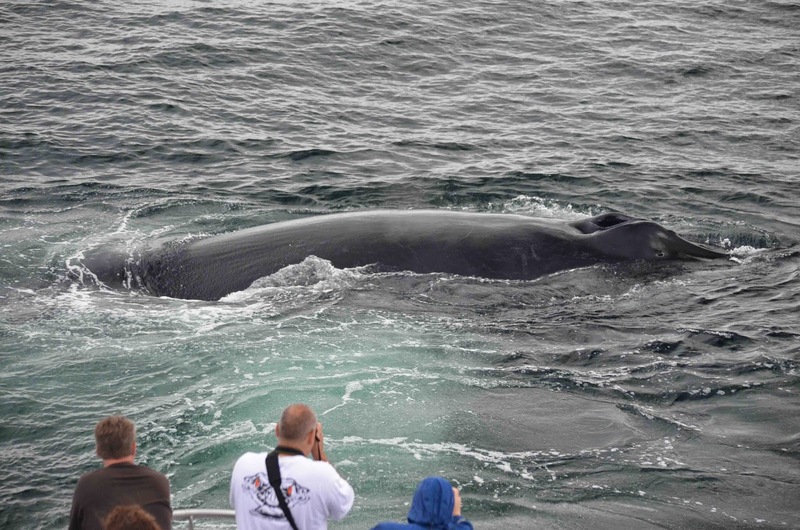 We blame Hurricane Arthur for our lack of whales on our second trip. Nonetheless, guests were super excited for the rare opportunity to see a storm developing offshore! Today on board the Asteria we headed southeast of Boston towards Stellwagen Bank. Despite the stormy conditions, the seas were relatively calm with less than 2 foot swells. 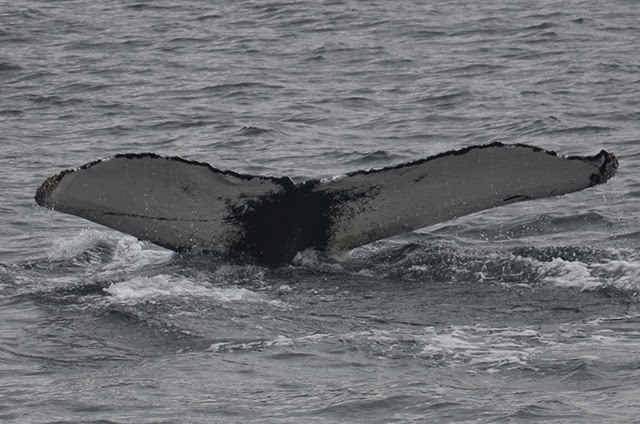 Just south of the bank, we found Mogul, a male humpback doing some subsurface feeding. Mogul alternated between fluking and non-fluking dives. In the area, there were at least 3 minkes. After watching Mogul, we travelled ahead to other blows in the distance. We found another humpback who was probably Hancock, but we didn’t get a very good look. Before heading back to Boston, we got to see two fin back whales traveling side by side. We were lucky to have such good sightings considering the fact that a hurricane was headed our way!